Captain Kel Cheris is a mathematical genius, lover of terrible dramas, and friend to servitors, a type of robot that's only recently gained sentience. She's a member of the Kel, one out of six factions in Ninefox Gambit's hexarchate, who routinely carry out dangerous (and often suicidal) military missions. This was her choice; she could have been a Nirai, the technologically-oriented faction, but instead she joined the Kel, to feel like one of a team. Still, Cheris is a little too willing to bend certain rules, and, when she uses heretical tactics to save her entire unit from dying, she is disgraced. Instead of being forced to leave the Kel entirely, however, she is allowed to redeem herself when a high officer realizes that her mathematical abilities may make her useful to a plot she knows nothing about. Shuos Jedao is also instrumental to this plot. He is a tactical genius who has never lost a battle. He is a Shuos—the strategic faction that is known for its elaborate games of political and military manipulation—through and through. He also happens to be undead, and can no longer take corporeal form. In order to speak, he has to hole up inside somebody's head. It doesn't help that, while still alive, he massacred an enemy army by simultaneously massacring his own. But taking back the Fortress of Scattered Needles requires the abilities of both Jedao and Cheris, so Cheris has no choice but to allow him in. This summary does not at all mimic the experience of actually reading Ninefox Gambit, a novel that throws you into its world without any preparation, trusting that, even if you don't understand everything, you'll be able to survive it. The world isn't translated into the terms of ours. But Ninefox Gambit also pulls off the trick of making you care so much about its universe that you make it through. People fly through space on things called boxmoths, bannermoths, and cindermoths; the word "calendar" takes on more meanings than I can really parse out. Imagining what these things are, and what they mean, becomes more than a game. It becomes a reading protocol that roots itself in your heart, and that's where Ninefox Gambit remains, for me. It's very Jedao-like, in a certain way: elusive, cunning, endlessly charming, and sometimes cruel; intelligent in thrilling ways, and steering towards something that I can't always see, but that I have to believe exists. It is hard to talk about a book that has suddenly become this important to me without losing coherence, but I will try. There are many, many rules in Ninefox Gambit that we can never know about for certain. This isn't that radical a thing to say about a science fiction novel, but one of the rules we do know about Ninefox Gambit is that rules matter. These are the rules that are responsible not just for structuring how the logic of the story works, but also for structuring the hexarchate, the government which rules Cheris's society. The hexarchate is based on a calendar, which is responsible for controlling not only how weapons and technology function, but also how society itself functions. The formation instinct given to every member of the Kel is, in a way, a smaller-scale, harsher version of this: there is meaning, and goodness, in following orders, and in conforming to what is asked of you. Not doing so, on the other hand, can cause unbearable anguish, and also leads to widespread chaos. The implementation of formation instinct is one of the hexarchate's rules, and we know about some others, as well (the approximate roles of different factions such as the Kel and Shuos, remembrances, certain nuances of Kel social interactions, high and low languages); but many of them are inaccessible, either because of the focus of the story, the knowledge of the characters, or because no one person can adequately trace them all. No character knows the full ramifications of all of the rules, not even Jedao. Part of Jedao's skill as a tactician comes from being able to recognize gaps in his own knowledge, and to press on the gaps in other people's. However, this is a world that confronts you with its own depth—there are facts that you are expected to know (but can't), and questions that you are supposed to know won't be answered (but which become pressing anyway). There certainly is value, and a lot of fun, in parsing out the specifics of what's taking place behind what we immediately experience in reading the story. Rereading Ninefox Gambit feels like slowly getting the hang of a foreign language, understanding a phrase that was once incomprehensible. Your eyes start to adjust to the dark. This is a type of reading that I think Jedao might like, and maybe Cheris, too—picking things apart, giving each element its proper due, shifting focus until things start to cohere. It is a process of gaining intimacy. But that process is always tempered by the experience that you get when reading a book for the first time. 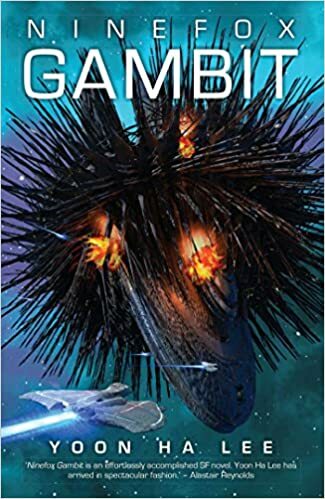 Just as Cheris has no idea what to make of Jedao for much of the book, but is overwhelmed by emotions about him (and, occasionally, by emotions that belong to him), Ninefox Gambit slams us with a world that it assumes we belong to, even though we do not. We don't have very many facts to hang onto. It's up to us to come up with something that we think makes sense, to follow our noses. Like calendrical warfare itself, reading Ninefox Gambit is ultimately about hearts. What matters most is what we believe about this particular place. How it feels to be there. What we notice, and what we allow to accrue meaning to itself. What meaning is forced upon us, or confused, or ripped away due to motives that are impossible to parse. Who we become as a result of what beliefs and meanings we grapple with. Belief, we eventually piece together, is what gives the hexarchate its power. "Heresy" is not some kind of euphemism—it is actually a different belief system that changes how technology and weapons function (or ceases their functioning altogether). "Calendrical rot" is, in one sense, a type of ideological corruption, and when the Fortress of Scattered Needles is overtaken by heretics, those differing beliefs are not a symptom or a symbol, but the root of the problem. Reading the first chapter of Ninefox Gambit for the first time is an exercise in wading through beliefs. We can recognize that we're reading about a battle scene, and that we're also reading about one particular person, Cheris, who is in deep, deep trouble. But other than that, we're dealing with something foreign, even if we can parse individual words. This is how the fourth paragraph of the book starts: "According to the briefing, the Eels had a directional storm generator. The storms scrambled vectors. The effect was localized, but it was troublesome when parallel columns ended up at opposite ends of a road a hundred kays apart, and fatal when movement along the planetary surface sent you underground instead" (p. 5). This is a passage that is starting to flow together now, on my third or fourth reading, but at first I didn't know what to do. What is a "directional storm?" What is it like? Are these vectors somehow physical, or just representations of something? What are columns? This is information that is assumed; Cheris already knows it, and she's the one we are following here. It is the fact of Cheris being there, imbuing these different things with her own frustration and concentration, which makes this more than an incomprehensible infodump. We don't just see these things in isolation—they have an orientation and a shape. We're tracking what Cheris believes and understands, which gives us a starting place from which to form our own beliefs about what's happening. We also know that Cheris is a soldier taking part in a battle. I'm never too far away from thinking about the Iliad, and I couldn't help but smell a little bit of the Iliad in Ninefox Gambit: the gruesome carnage presented unblinkingly but without exploitation; questions about control and levels of authority; the differences between infantry and commanding officers; the meaning and source of death; even the power of one's own history and reputation. Here is one of Ninefox Gambit's first descriptions of carnage: "Feet scraped inside-out next to unblemished boots. Black-and-gold Kel uniforms braided into cracked rib cages. Gape-jawed, twisted skulls with eye sockets staring out of their sides and strands of tendon knotted through crumbling teeth. A book of profanities written in every futile shade of red the human body had ever devised, its pages upended over the battlefield from horizon to horizon" (p. 6). This description is not just meant to shock, or to be beautiful, because it exists primarily to talk about the effect of a weapon that a person has used upon other people. One of the reasons the Iliad is permanently rooted in my head is the way it lingers on its people, even if we only see them briefly. This is true of Ninefox Gambit, too, where we're forced to feel how much orders matter because we see who it is they're killing. The novel's beauty is in the way it deals with these real problems, and it is in the relationship between Cheris and Jedao, the human weapon, where they are dealt with most meaningfully. Cheris and Jedao discuss many of these questions directly, and Cheris contemplates them while trying to understand Jedao. How is it that Jedao could have chosen to massacre so many people, and how can he stand remembering them all? Cheris needs to know, because she needs to know how far she can trust him, and how to interpret the things he says. How does Cheris send infantry to die, when she, so recently an infantry captain, is so used to joining them on the battlefield? And what is the difference between Jedao the historical figure and Jedao the person? The first time Jedao was asked to take corporeal form, it was by "senior high generals [who] remembered what I'd done . . . I wasn't a historical figure, I was a real person" (p. 310). Now, a few hundred years later, Jedao's reputation is all he has, and he has cultivated it carefully. Cheris treats him as that reputation, since that is what she sees and knows. But that isn't tenable, because in order to work together, they have to see each other as full people. They can never become completely visible to each other, maybe, but the problems they both have, and the things that matter to each of them, slowly come out. Eventually, they develop a mutual respect that seems to surprise both of them. One of the book's best moments is when Cheris asks a group of servitors to execute a plan: Jedao is furious, at first, but Cheris's love for servitors turns out to be more than an eccentricity . The plan works, and Jedao has to admit that, this time, Cheris was right, and that she was able to see something he wasn't. Getting to a place of mutual respect is a painful process, particularly for Cheris, and that makes their relationship a tricky one to talk about. Jedao has power over Cheris because she's the only one who can hear him, because of his superior tactical ability, his skill at manipulation, and her fear. He uses this power for his own gain, even if he has understandable reasons for doing so. He plays with Cheris's vulnerabilities, and occasionally hurts her. It is not a healthy relationship, at least not at its beginning. When I was first thinking about this review, I worried that I would skim over that aspect of their dynamic because I love the characters so much, which is something I've done with other works in the past. Reading about the way Jedao treats Cheris can be difficult, and it's supposed to be. But Ninefox Gambit does not try to make excuses for what Jedao does, and it legitimizes Cheris's very real pain. We are not asked to think of their relationship as healthy, or even positive, at the beginning—although, as it grows, I do think it becomes closer to a partnership, even if it can never become a true one. (It is also a relationship free of romance or sexual tension, which, at least for me, makes the inequality easier to stomach, because it is built in: Jedao is Cheris's commanding officer.) Their relationship is a way to pose questions and to force these characters to confront certain problems about themselves and the things about their society that they want to change. In order for either of them to get what they want, they have to respect what the other can do. This does not necessarily require them to respect each other, but that is what happens. I started loving this book because I loved the way its world felt, but caring about these two people, individually and together, is why I kept loving it all the way through. In the last portion of the book, Cheris gains direct access to Jedao's memories due to one of Ninefox Gambit's many pieces of insanely awesome (and insanely destructive) weaponry. But in doing so, she also becomes an entirely new person, not just the same person with a different perspective. The memories Cheris takes—by literally swallowing them—are all that's left of Jedao, and she remembers them by living through them as Jedao, retaining only her name. This gives her a perspective that was unavailable to her before, because she was, quite literally, a different person before. She is not one person gaining new beliefs—she is a person made out of the beliefs of two people, with different sources. (Steven Universe, anyone?) The two of them spend most of the book navigating their intimacy, which has been forced upon them by circumstance, but which becomes genuine by the end. Yet there is still some amount of distance between us and Jedao, no matter what, simply because we almost always see him as filtered through Cheris. By the time Jedao and Cheris become the same person, we have no way of asking what Jedao really thought of Cheris, and how much he really cared about her. Jedao's memories are the only time when we get a sense of how close Cheris was to being right about Jedao, and how much he could have cared about her. By the end of Ninefox Gambit, then, we know Jedao like he knew himself, or, at least, we get close. But Cheris is a lot harder to get to know. Every time we learn something new about Jedao, it's a sock in the gut, both for us and for Cheris, and his voice is so distinctive, and his position so unlike anyone else's, that by the end of the novel he feels completely real. But one of the novel's main concerns is the mystery of Jedao's identity and uncovering his history. As a result, a large amount of Cheris's identity becomes about her trying to answer questions about the person who's living inside her head. It doesn't help that Cheris is simultaneously learning how to wrench herself free from the formation instinct learned (or given to? or forced upon?) all Kel soldiers, which forces obedience and unquestioning loyalty to those in authority positions. More of Cheris came out when I read the book again, especially her particular type of ingenuity, her willingness to work with servitors, and the way her style of command changes. But it did still feel like many of the snippets we get about Cheris's personality are thinner than she deserves. When we finally get an explanation for why Cheris went to Kel Academy instead of Nirai Academy, the more obvious choice for someone with her mathematical abilities, the reveal feels . . . flimsy. I didn't believe that the reason she gave was the whole story, but the book didn't push the question very much. I want more of Cheris. I get the feeling that she runs as deep as Jedao, but I want more of a chance to see it. Nevertheless, Cheris is still rich enough, as she stands, to make the whole book work. She lands in the middle of an elaborate and incomprehensible plan and figures out a way through it that is uniquely her own, and that speaks to what matters to her. This isn't unlike what the reader of Ninefox Gambit has to do. "You know what's going on, right?" Ninefox Gambit asks. Often, you have to say, "Uh, yeah, of course," when the real answer is "I have no idea, but I really, really care." And then you keep reading.